FULL DISCLOSURE: I hated EVERY party I had growing up. Ironically, my parties were THE hot topic at the school bus stop year after year. The anticipation would start to build right after the new year. People whispered and contemplated: What would be the theme, fun inventive activity, award winning cake, trendy new party favor? Sounds like every kids dream, right? Not for me. 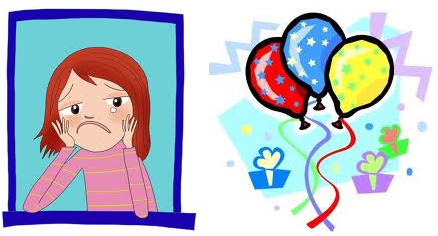 Why was I miserable and totally unsatisfied with each and every one of my parties growing up? For starters, my mother would undoubtedly always exceed her budget and spent countless hours planning for each party, hoping that perhaps this time around, I would finally enjoy it. I think my mom finally gave up trying to satisfy my unattainable expectations when 'THE Bat Mitzvah of the year' was just not good enough. Don't get me wrong, I wasn't an unappreciative, obnoxious and bratty kid. (seriously!) In fact I was very social and enjoyed a fun gathering. I loved attending all of my friend's parties... just not my own. Light Bulb Moment: I am that person who would rather GIVE a gift than RECEIVE. In the past 20 years, I have grown to realize the problem...planning, attending and enjoying my own party is an impossible task for me. I am way too focused on everyone else having fun. I am always so wrapped up in each detail executed perfectly to stop and enjoy a good party myself- even if the party is for me. So how did I end up in the events industry? Who knew back in 1995 that there was such a profession called a "party planner"? Despite all I've said so far about planning my own events, somehow I serendipitously stumbled into this INCREDIBLE industry and found my calling. I LOVE every aspect of planning events (not for me) but for my clients. My ultimate goal of every party is to see my clients dancing, belly laughing or just simply enjoying themselves. I know my goal has been successfully achieved when my client can kick back and enjoy their party without worrying about ANYTHING behind the scenes. My secret to event success: Hiring a professional event planner such as Sequence is a MUST! Even though I am really good at what I do and LOVE every element of the pre-planning, I too will hire my colleagues at Sequence for my next big party! In my opinion, planning the logistics and having such a strong emotional connection to all moving parts of the party just does not work. I am incredibly relieved to find out that I wasn't a spoiled and unappreciative kid. Instead I was just too concerned about everyone else's experience to enjoy the party for myself - the perfect characteristic for your ideal event planner!